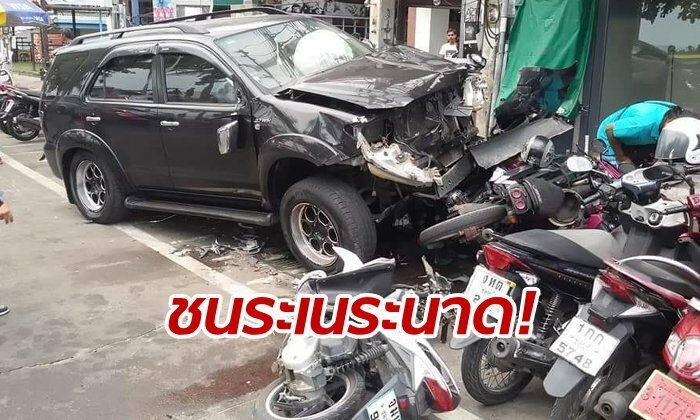 Thai media reported that the Toyota Fortuner that slammed into a line of motorbikes injuring many people yesterday was driven by a British man. Sanook and The Pattaya News said in stories that he was arrested by police and tested for alcohol. The news media said that he appeared drunk. They also both reported that he has a prosthetic left arm. Some 15 bikes were damaged and the back of a song thaew was also damaged in the accident around 11 am Tuesday. A 60 year old female tourist, a 65 year old male tourist and a 40-45 year old Thai man were reportedly injured at the scene. 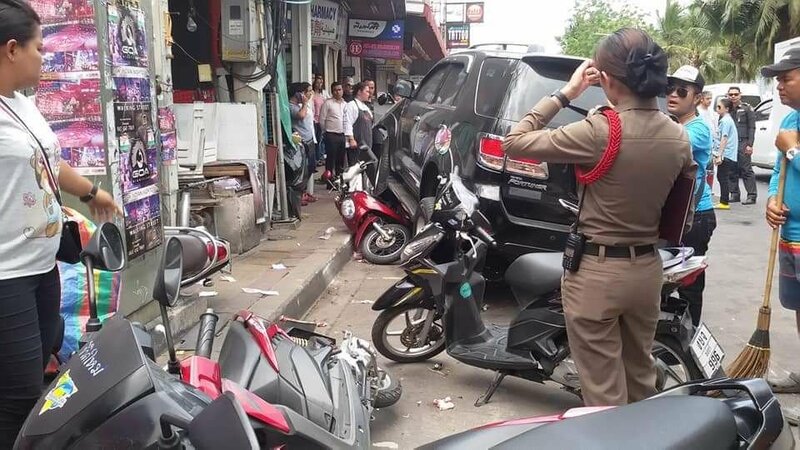 Reports suggested that the Fortuner arrived at speed and hit a bike coming out of a bank near the end of Soi 13/3 on Beach Road. Losing control the Fortuner then collided with a song thaew and plowed into the line of bikes. Poor Thai guy on the ground , everyone seems to be ignoring him. Even the ambulance passed on by. I just wonder why you would film wounded people and post it on internet? You can't accuse him of being harmless in this accident. He seemed ok when they interviewed him,he said he was on the bike coming out of the bank. Prosthetic arm or not, having an accident like this when drunk will normally see you in jail for a significant period in many places around the world. This being Thailand, it is more likely to be a case of how much money it costs him. They tested his alcohol, but the report doesn't say he had any in him. So it's either very poor reporting or he simply had no alcohol in him. 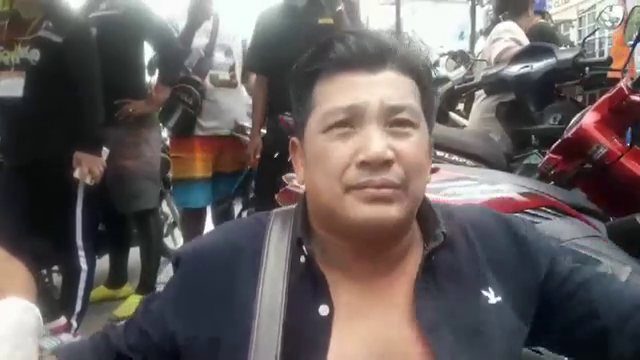 They said he "appeared drunk" but that means nothing, people appear in such a way to fit a context and a guy who just had a wreck like that, in pattaya, would already be presumed (therefore appear) drunk. I wish the reporting actually was better because as it is written, he didn't consume any alcohol and the only thing suggesting that is the hear-say that always gets injected. he's got a lot of problems and it's going to be expensive. Quite right. Nothing in the OP confirms he had been drinking. I am sure he must have been in shock. What does that look like? The longer he stays down the bigger the pay packet. It appears he has a hand injury. As always the reporting we read in this articles is clumsy beyond belief. That said: What caused such an accident? I hope this is just an extremely random accident and not the result of DUI..., but unfortunately there is too much of this stuff in Thailand... We have to watch our backs in every situation. I noticed that after an accident the Thai always stay on the floor for a long time.....why is that? Definitely another bad Foutuner it seems they are often involved in accidents. He must have had a brake failure,if he uses that as an excuse then it's not his fault. They watch too much soccer!